A 27-hole club on the road going uphill North past Valderrama. Almenara is the most Westerly of all clubs reviewed on this Web site – based on accurate private GPS readings. The other premium courses La Reserva and Sotogrande are also close by. So Almenara has some pretty fierce competition in terms of adjacent quality courses. Almenara does not compete head-on with these premium courses. Instead it offers a more average golf experience at very reasonable prices. I like Almenara a lot. A club I go back to anytime, whereas premium courses are more of a special treat for me. The Almenara clubhouse sits at the head of a valley with tremendous views from the clubhouse terrace to the sea in the distance and the small mountain ranges inland and East – running continuously behind the entire Costa del Sol. All three 9-hole courses at Almenara start and end at the clubhouse, so you can mix-and-match the 9-hole options as you wish. The three courses are called Pinos (Pines), Alcornoques (Cork Oaks) and Lagos (Lakes). On some 27-hole courses, one of the 9-holes is a bit of a compromise i.e. a poor course compared to the other two 9-holes. This is NOT the case with Almenara. All three 9-holes are each 'proper golf', so you do not need to worry about avoiding one of the 9-holes as a sort of poor cousin. All three 9-holes have about the same degree of 'drop' from the clubhouse down to the lowest point of the 9-holes. This is fairly substantial. So you play some quite steep downhill holes then uphill holes again back up to the clubhouse. The entire layout at Almenara is also big and spacious. That is, very few holes have another fairway close by. The size and incline on all the 9-holes means I personally would not choose to walk any 18-hole combination, although I see plenty of people who do – quite slowly it must be said. The three 9-holes are in my view more alike than they are different – and all maintained to the same level. The best feature by far is the greens. These are really good. Very tightly mowed and smooth grass surface. Quite slow on some days I have played, on other days quite fast. But consistent - once you see how the putts roll on the first 2 greens, you can be sure the other greens will be the same speed. The greens are mostly quite flat, only a few having strong slope or tiers. They hold approach shots well and are not hard-surfaced (where your ball could easily bounce straight through the green). Medium-sized and a good variety of shapes – some oval, some kidney-shaped etc. Less than 1 meter off the green they mow quite tightly then another 2 meters out a bit less so. This means green surrounds are very good quality. Once you see how one green does this, you know you can expect the same high standard for every other hole on your round. Fairways are good width, although the opening holes on Pinos are quite tight. Fairway grass quality is good. 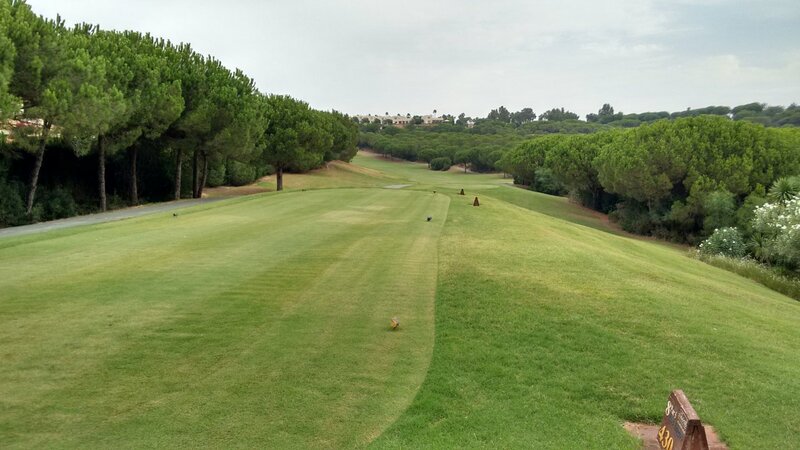 The grass on the fairways at Almenara is mowed very short. This means in the Winter months of the year that the grass struggles and fairways are quite muddy. The fairways are still soft and easy to play off, so I personally do not think this represents a problem. Mature trees – mostly pines, some oaks - line fairways. Water hazards (mostly large lakes) are in play on 5 holes on Lagos and 5 holes on Alcornoques, but not at all on Pinos. Bunkers are not a notable feature of the course. Standard set of bunkers in positions you would expect, often slightly set down with nice fine sand. Tee boxes are OK. There are good quality wooden carved hole maps on every tee and the scorecard has an accurate course map on the back. The main point about the fairways and hazards is that the entire course is really 'positional golf'. On every hole up to the green there is a best line that usually requires good distance for best position. If you miss that position (slightly wrong distance or direction) then you are not necessarily punished hard, but your chance of hitting the green in regulation fades away. I personally think this is really nice golf – reward for playing a hole well, but not always disastrous if you do not get it quite right. For mid-handicap golfers like me, that is a really good challenge. And I love the sheer variety of this course. It really is a case of "every hole is different". All the holes are meaty enough to keep the low-handicap golfers interested. Golfers with handicap up to 25 can still enjoy plotting their way around this course. There are no really difficult holes that will scare a golfer at that level. Above 25 handicap I am not so sure – this is certainly not an easy, flat course – and some tee shots require significant carry. Overall I think a good course for players up to 25 handicap. The very good golfers (around scratch) might find it quite easy, but then if they are unhappy they should be playing another course designed to be tougher anyway. You can not criticise Almenara for what it was never designed to be. Other nice things about Almenara: Firstly, the course is some distance from any main road and within the Sotogrande urbanisation (covering 4 courses) there are high-end villas that are only infrequently occupied. So every round is pretty much guaranteed to be very serene and tranquil. Secondly, the cost of golf at Almenara (particularly casual rounds) I think is very reasonable – outstanding value-for-money. The clubhouse is mid-sized and comfortable. The staff are pleasant and try hard, but the service and food is variable quality. Sometimes good, sometimes not. Even with enough serving staff on duty, the service can be slow. I think they have a bottleneck in the ordering/paying process. Maybe just not enough tills. Also simple snack food (like a toasted ham-and-cheese sandwich with fries I had there a few times) can be luke-warm, soggy, tasteless. They really should be able to do much better than that. This is criticism of the hotel catering side of Almenara, not of the golf side of their business. I think the hotel managers simply need to get out there and talk to some customers. The organisational problems they have are easily fixed. This is a very small blot on what is otherwise a really good golfing experience. So I continue to recommend Almenara highly. Top 5 club/course for what I want in terms of golf on the Costa del Sol. Very nice indeed. Review last updated: August 2015. Number of times played: 6. The yellow dots represent the possible combinations of the 9-holes to make up 18 holes on the Almenara course. The longest and most difficult combination is Los Lagos + Los Pinos. 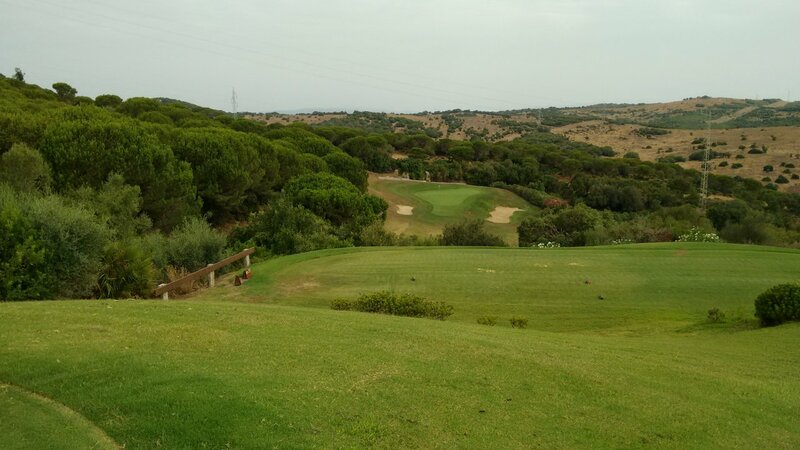 Almenara is basically slightly longer than the average golf course on the Costa del Sol and about average difficulty. 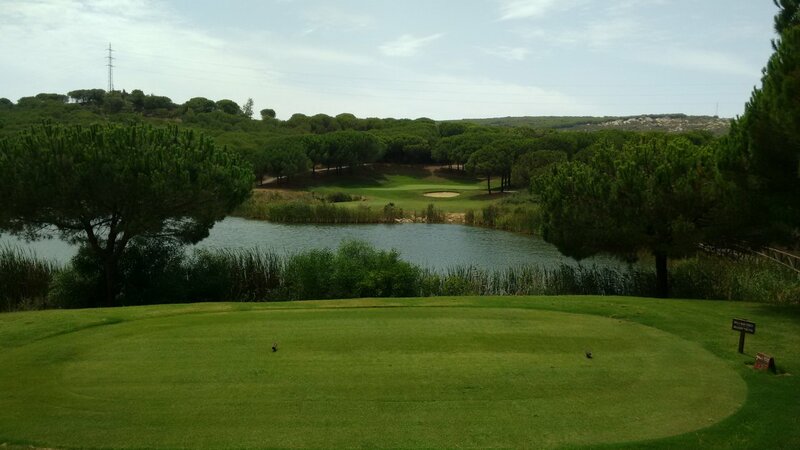 An 18-handicap player can expect to go around Almenara in about 19 or 20 over par.